If we pay payroll taxes for 30 or 40 or 50 years as I did, then an individual is entitled to expect that the government lives up it its promises and provides adequate Social Security and Medicare benefits. If lenders lend money to the US government to fund the US national debt as wealthy citizens here in the US and around the world together with some governments have done, then they are entitled to expect repayment with interest in the future. 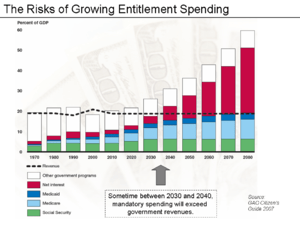 Thus it is possible to look at all government expenditures as an entitlement of some sort. One principal difference among the various forms of entitlement is whether the funding is voluntary or forced through taxation. Another principal difference and one that is often overlooked is who are the beneficiaries of government entitlements? In the case of Social Security and Medicare, the beneficiaries are the 99%. The 1% pay payroll taxes too, but they are wealthy enough to pay for their own retirement and health care, most of us are not. The beneficiaries of the national debt being repaid are the 1%, wealthy individuals here in the US and around the world and some governments. As I see it, some in government are willing to reduce some entitlements if the beneficiaries are the poor and middle class, while entitlements for the 1% must not be touched. Looked at that way, the GOP willingness to reduce Social Security and Medicare while preserving those entitlements of the wealthy 1% make perfect sense.